If you are not yet using Pinterest to market your products or services, you’re missing a significant marketing opportunity on a less saturated advertising platform. More than 87 percent of Pinterest users have bought a product because of the site. With 81% of Pinterest users being female, this social channel allows you to reach the household decision maker directly, and in an environment they are relaxed in and trust. Pinterest self-reports that 2 million pins are saved to a shopping board on a daily basis, and millennials, in particular, are using Pinterest as much as they do Instagram. If you’re already using Pinterest, it becomes crucial for us to prime this conversation before we dive into advertising strategies. Pinterest is first and foremost a visual social media platform where users often discover new things, seek creative inspiration, and keep a bookmark of options for the future (including products/services they would like to purchase). If you decide to use Pinterest for marketing, you must commit to creating high-quality visual content. If you are a business on Pinterest it’s important to create a free business account and not a personal account, to access advertising. Learn more about the basics of setting up your Pinterest business account successfully in our previous article. In this article, we focus on 5 strategies to generate new leads for your business on Pinterest, how to grow your email list, and how to promote and increase sales conversions. Holding a contest on your Pinterest page is a great way to draw in new leads and increase engagement. One contest that’s easy to host and incredibly effective is the Woobox Pin-To-Win, where you provide your audience with several pins they need to re-pin to win a prize. This fun interactive campaign type introduces your brand to new audiences and re-engages your current Pinterest followers. The easiest way to host a branded contest is through contest software. Woobox and its Support team makes it easy to both create and manage your own Pin-To-Win contests. You can even capture lead information in the process, growing your email list with new leads. Bonus: You can also cross-promote your campaign on Facebook for double the traction. You can learn how to set up ads on Facebook for contests in this previous article. Pinterest ads are incredibly easy to setup, and very budget friendly. Pinterest has even created a thorough guide on how to use Pinterest advertising and set up your first ad. After launching your first few ads, you can track your best performing pings and choose to further promote those. Pinterest also has great targeting options, including customer list targeting and retargeting, for both people that have visited your website or engaged with your pins. Bonus Tip: If you run a Pin-To-Win contest discussed in the first strategy, you can run secondary promoted Pins that will automatically retarget all of those users engaged with your contest advertising your product or service. You can also target based on interests, keywords (one of the most useful and powerful targeting options), location, language, gender, and something called “Dynamic Targeting” which has Pinterest determine to who to show your ad to based on the content of the ad. You can create a tab on your Facebook account that presents your Facebook audience with your latest pins and a sleek view all of your Pinterest boards without leaving your Facebook page. 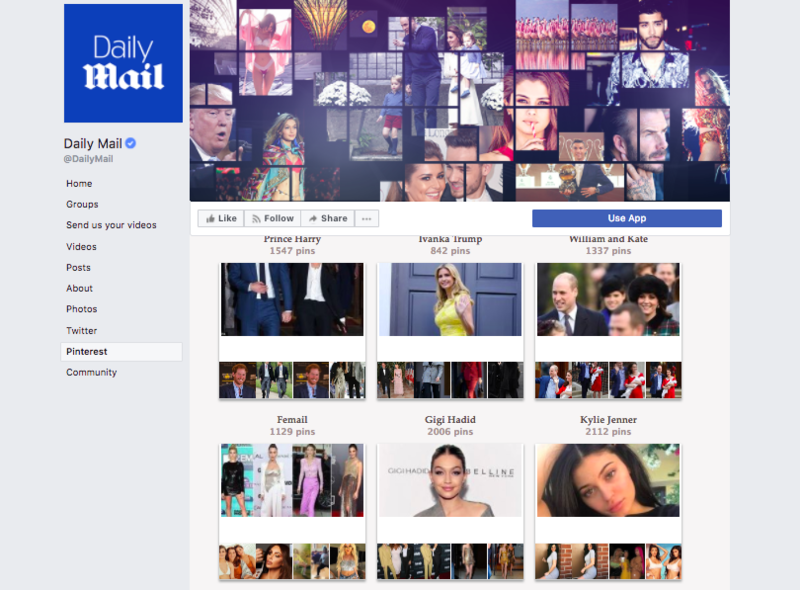 Here’s an example from Daily Mail who uses Woobox to display their Pinterest boards from a tab on Facebook. A feature called Rich Pins on Pinterest provides a way for a pin to have more context about a specific pin, allowing more information to be shown beyond the image. There are 4 types of rich pins, with one focused on articles, allowing users to see an article headline and story description. This feature makes a Pin more searchable and highlights a pin from other content on the platform. A great way to nurture leads on your Pinterest page is to share blog content from your website that is useful and provides solutions to problems your Pinterest followers are experiencing. Getting really creative, you can even create custom reading lists that provide solutions to specific problems on individual boards so your followers can find what they are looking for easily as they browse your boards. On a lead capture side, when you post a blog, make sure that blog has a CTA and opt-in offers. You can also post lead pages for gated content like eBooks, videos, research, assets, and more as pins and link directly to those opt-in pages where users who are interested will exchange their email for this free information. So we’ve covered one kind of “Rich Pin” but there are two other kinds there are three other kinds that can help businesses more easily turn their pin content into actual sales. The first kind of Rich Pin is called a “Product Pin” that is an excellent choice for products that users can shop. The Product PIn showcases where the product displayed in the image can be purchased. It also includes a link to the product page and shares pricing information in real time. These pins encourage impulse buys, as well as have better click-through rates and searchability on Pinterest. Another great perk is that if you even slightly reduce the price of your product, anyone who Repinned your product will be notified via email by Pinterest that the price has dropped with a prompt to buy. Bonus: A creative marketing strategy you can use on your Pinterest page if you have a product(s) your selling is to create a “gift guide” that includes your product(s) as well as others (so it doesn’t look like a giant ad). This can also create extra revenues through affiliate partnerships with the other brand products you are featuring. The next kind of Rich Pin that supports conversions is called an “App Pin”. These pins will display an “install” button CTA to attract users to download your application without leaving Pinterest. Right now App Pins are only compatible with iOS. The third kind of conversion based Rich Pin is called a “Recipe Pin” which shows an image and a description that a pinner can manually enter, specifically for recipes. Companies in the food product space can put direct links into their recipe pins to their product page to encourage the user to purchase the ingredient(s) from them. Pinterest provides analytics for your business account and can share insights into demographics for interacting with and viewing your page and pins. You’re also able to see which of your pins perform well, and see similar data to Facebook such as average daily impressions, average monthly engagements, and more. You can use this data to lead future content decisions and seek new, similar audience profiles. Pinterest has a video guide on how to use their analytics here. Woobox makes it easy and manageable to grow followers and exposure for your Pinterest page. We also make bringing your Pinterest content to your Facebook page for further engagement seamless. Signing up for a Woobox account allows you to build campaigns, and create as many giveaways, quizzes, and promotions as you’d like for free. Subscriptions are only required to publish and run a campaign. Learn more at Woobox.com.